Routine dental cleanings can help maintain your smile for years to come. Growing older brings some of life’s best gifts—grandkids, retirement, and maybe even travel or more time for hobbies. But it can also bring unwanted health issues—especially related to your teeth. Here are some of the most common oral health issues faced by seniors. 1. Darkened teeth. With age, dentin, also known as the bone-like tissue beneath tooth enamel, changes depending on the foods or drinks we consume. A thinning outer layer will allow yellow dentin to show through, which may create the appearance of darkened teeth. 2. Excessive dry mouth. Many seniors take a variety of medications that can cause dry mouth. Adequate saliva production is important to prevent decay and infection. Remember to stay hydrated by consuming enough water each day. 3. Root decay. After years of consuming acidy foods, your tooth’s roots may become exposed. 4. Stomatitis induced by dentures. This is an inflammation of underlying tissue beneath false teeth often caused by ill-fitting dentures or bad hygiene. 5. Uneven jawbone. 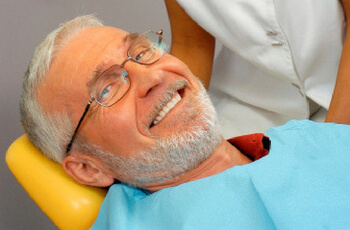 If you lose a tooth and don’t replace it with an implant or dentures, the remaining teeth in your mouth may shift into different spaces, which can result in an uneven jawbone or bite issues. If you’re noticing signs of aging in your teeth, remember to keep up your regularly scheduled appointments with our practice. If it’s been a while since your last visit, give us a call today. « Is Chewing Gum Really Bad for Your Teeth?